Freiherr Richard von Kühlmann [1873-1948]; Curtis O. Baer [1898-1976]; by descent to Dr. and Mrs. George Baer; designated purchase by NGA with funds contributed by Walter H. and Leonore Annenberg, 1990. Symposium of the Graphic Arts, Wesleyan University, Middletown, Connecticut, 1955. Master Drawings from Titian to Picasso, The Curtis O. Baer Collection, National Gallery of Art, Washington, and tour, 1985-1987, no. 27 (cat. by Eric M. Zafran). Art for the Nation, Gifts in Honor of the 50th Anniversary of the National Gallery of Art, National Gallery of Art, Washington, 1991, pp. 24-25. The Sweet Uses of Adversity, Images of the Biblical Job. The Mitchell Gallery, St. John's College, Annapolis, 2002, 57, no. 11, and 58, under no. 12. Hoetink, H.R. 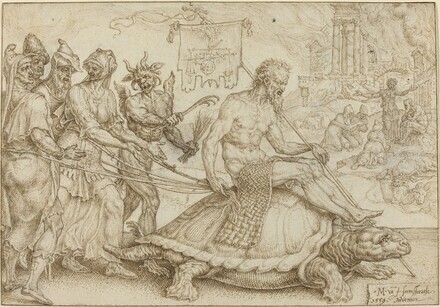 "Heemskerck en het zestiende eeuwse spiritualisme," Bulletin Museum Boymans-van Beuningen 12, no. 1 (1961): 15. Oberhuber, Konrad, ed. Renaissance and Baroque Drawings from the Collection of John and Alice Steiner. Exh. cat. Fogg Art Museum, Cambridge, 1977: 124. Veldman, Ilja M. Maarten van Heemskerck and Dutch Humanism in the Sixteenth Century. Maarssen, 1977: 62. Robinson, William, in Old Master Drawings from the Museum of Art, Rhode Island School of Design, exh. cat. Rhode Island School of Design, Providence, 1983: 173.